MAKING TRAINING & DEVELOPMENT WORK is designed to help practitioners in the field of training and development to develop the most appropriate set of practices that will work within their organisation. The book is aimed at practitioners in the field of training and development, whether internal or external consultants or specialists. 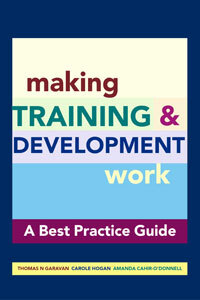 A new book designed for training managers, MAKING TRAINING AND DEVELOPMENT WORK, was launched at the annual CIPD Training and Development Conference. The authors, Thomas Garavan, Carole Hogan and Amanda Cahir-O’Donnell have come together to produce a publication that seeks to help you make quality decisions about the best learning options to select when you are faced with specific problems. This 600-page ‘best practice guide’ is designed to help develop the most appropriate set of practices that will work within your own organisation, and to help you select the most appropriate delivery strategy, training methods, style of delivery and evaluation methods. Learning objectives are outlined at the start of each chapter, followed by a practical example designed to stimulate your thinking. At the end of each chapter, the key learning points of the case example are highlighted and a set of action points on best practice provided. MAKING TRAINING AND DEVELOPMENT WORK is written for every training manager, trainer, training specialist and instructional designer, or anyone who needs to develop a training and development strategy.